What Makes The Philips Norelco Shaver 9800 Unique? The Philips Norelco Shaver 9800 has it all. With ContourDetect technology, it glides smoothly along the contours of your face and neck. The V-Track precision blades lift the hair up for a closer shaver. Personalize your shaving experience and choose the device that will leave you with a refreshing, comfortable shave. What Is the Philips Norelco Shaver 9800 and How Does It Work? Looking for a top quality electric shaver has its challenges since there are so many options to choose from. When searching for the best one, you should consider several things. This is probably the most important feature. If a shaver doesn’t do the job, then it doesn’t matter how much money you save, how nice it fits in the palm of your hand, or how long the battery lasts. Make sure it will perform to your expectations. Did you examine how close it can shave? Can you find out what speed of motor it has? You want a high-quality product that can give you a clean, comfortable experience. Some prefer to shave in the shower, some out. This feature allows you to get the job done with or without foam. Cordless shavers use batteries that can be recharged. Look for one that takes the least amount of time to re-energize. Avoid getting a shaver that stays charged for less than 25 minutes. The top brands can hold around 60 minutes of battery life, making it convenient for multiple shaves before needing to sit in the charging station again. Some shavers feature an auto-cleaning cartridge. Although shavers with these options are much more expensive, they are convenient for the shave-and-go user to prevent them from having to worry about cleaning it after each use. Some shavers come with extra bells and whistles. Some have a built-in beard or head trimmer to make it handy to have just one tool for all the tasks. In 1939, Philips started making electric shavers. Their product spawned success in 1951 with the two-headed model. Philips has created numerous models since then, with varying features to fit the diverse needs of users. The Philips Norelco Shaver 9800 is one of the most recent and popular men’s shavers. With deluxe components, it is no wonder so many people consider this brand the top choice. The following are several features that make this easy-to-use product so elite. In addition to its remarkable inclusions, this uniquely designed shaver has even more outstanding elements. The features allow greater precision and high-quality performance. The heads consist of a ContourDetect technology. 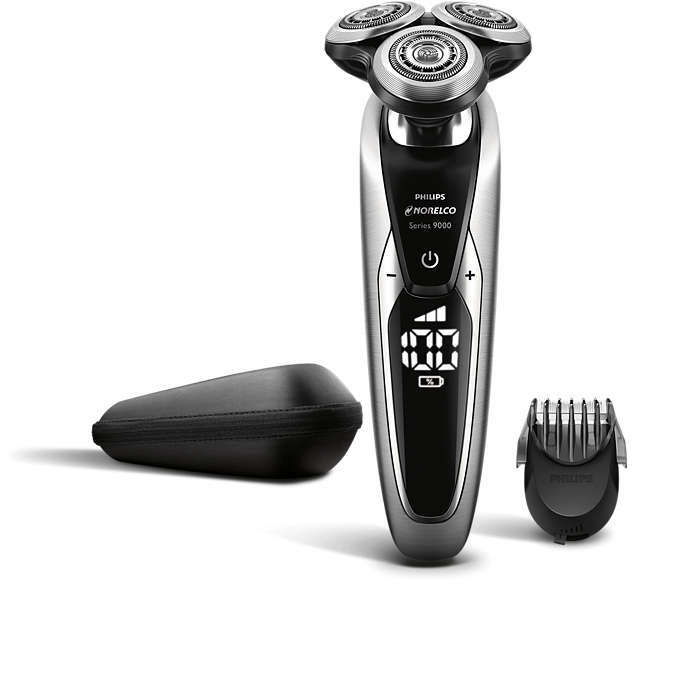 With heads that can move in eight directions, the shaver can move along every contour of your face and neck. This allows you to shave 20 percent more hairs with each pass, delivering smoother and softer skin. This shaver gets 30 percent closer than its competitors. It does this with its V-Track precision blades. The first blade positions each hair, raising it up so that the second blade can actually cut below the level of the skin. This produces an incredibly close shave. You can personalize your shaving experience with a choice of three speed settings. If you are in a hurry and need a quick shave, switch your shaver to the fast setting. On days when your face feels a little more sensitive and needs a more delicate touch, use the sensitive setting. For regularly, daily use, switch it to normal for an every-day thorough shave. You can decide whether you want to shave in the shower or have a dry shave. The design ensures safety by operating only in cordless mode when shaving with water. Add moisturizer with foam or gel for a more refreshing feel. 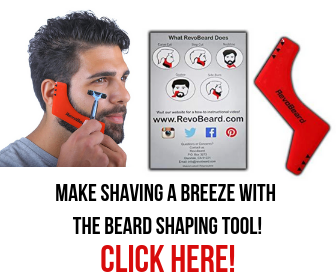 You can create a new look each day with the beard styling head. Just switch the head from the shaver to the beard trimmer and set it to your desired length, according to your mood or occasion. 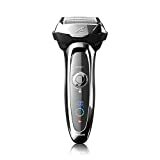 The cost to purchase the Philips Norelco Shaver 9800 is about $300 on Amazon. This includes shipping charges. If you are a member of Costco, you can get the shaver for the special club rate of $160. Occasionally, Costco will have a sale and drop the price about $40 more. Walmart offers this top brand shaver for $164.99, but it isn’t always in stock. Catching this deal may be a little more difficult than with other retail stores. If you can find it on eBay, you may be able to purchase it for as low as $199. It usually is a hit or miss with eBay, and occasionally you may end up with a used product without a warranty. Bonanza sells the shaver for $209 and offers free shipping. They classify this product as their top-rated seller. 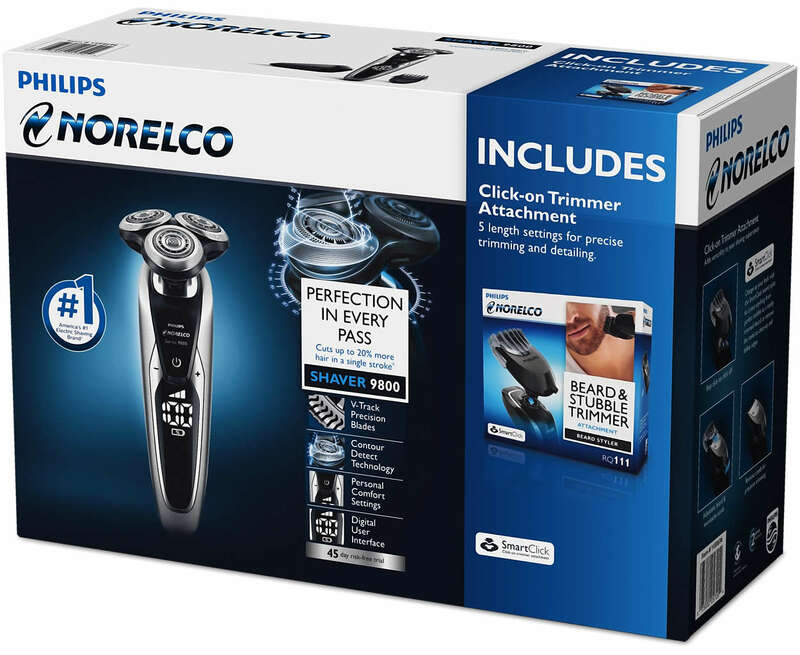 Other stores such as Best Buy and Target do not carry the Philip Norelco Shaver 9800 but do sell other shavers within the Philips series. Putting a product to the true test is placing it in front of the public and getting their genuine opinions. After using a device, customers have a good idea as to how well it performs and how much they like it. They also can have a bad opinion about something if it doesn’t deliver the way they expected. We have reviewed the opinions of users who have purchased the Philips Norelco Shaver 9800. We have seen how it works for them and whether or not they think it is a good value for the price. The following is a compilation of what buyers have concluded after using this product and what the overall rating was. On one site, the average age of people commenting was over 50. There were a few younger, but the majority belonged to the older generation. This may be since older people could possibly have a little more time to share their opinions than those that are younger. It doesn’t necessarily reflect the age of those likely to purchase this shaver. On another, more popular, site that shared reviews of this product, the age wasn’t disclosed. On some sites, the gender of the reviewers was revealed, which indicated 100 percent of males using this shaver. The other sites didn’t acknowledge whether the opinion was coming from a male or a female. Even though this shaver is geared towards men, including a bonus beard trimmer, it can also be effective for the shaving needs of women. Comments came from a number of people who varied in the length of time they owned the shaver. Some had only been using theirs for less than three months, while others had experience with the product for several years. Most people liked the design of the shaver. They appreciated it because it had a light touch and was comfortable to hold; in fact, it fits better in the user’s hand than other brands. Some customers liked how each new model was designed quieter than the last. One customer wasn’t as satisfied with the included case. The user wished for something that could hold both the shaver and the charger cord. Many customers found the shaver easy to use. Some found it more convenient than using a blade. Other users especially enjoyed the LCD display that made it convenient to see the percentage charge of the battery and when the unit needed to be cleaned. Over and over with many reviews, the shaver proved to give a close shave without irritation. Users stated they didn’t have to go over the same area twice. Customers reported that the shaver cleaned easily. Many people found it very convenient to wash after use. One customer purchased a cleaning system to accompany their shaver and found their experience to be even greater. Customers felt like they could shave without discomfort. The shaver didn’t irritate the skin and was reasonably fast. One customer felt that the accessories included were chosen well. The user didn’t want to have to pay extra for the cleaning station because they didn’t need one, but they were glad for the bonus beard trimmer. Some people are loyal customers to Norelco shavers. One gentleman enjoys using his daily and has previously owned other Norelco products for nearly 12 years. Another customer has been using the Norelco line for almost 70 years and is very pleased. One user had a heavy and coarse beard. After using the trimmer, he did not have any skin irritation, which was very important to him. Customers felt like the shaver was an excellent purchase. They were impressed with the features and the overall performance, and many felt that it was a good price for the product. Some customers felt the price was high, although they still liked the product. Then again, others felt that it was an exceptional product that was very affordable. Some customers agreed that the quick charge was a convenient feature. Others appreciated the advantage of the long battery life. The digital display was also mentioned as a beneficial feature. Overall, most users rated this shaver with 4 or 5 stars. They thought it was outstanding and highly recommended it. 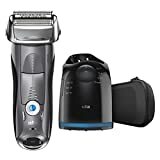 While a few people did find some dissatisfaction in a couple of the features, the Philips Norelco Shaver 9800 was considered the best brand among the majority of reviewers. There are other good shavers on the market. We wanted to see how the Philips Norelco Shaver 9800 compared to these other top brands. Four synchronised shaving elements achieve in one stroke what others do in two*. Unlike the Philips Norelco, this shaver does not have the tri-rotary blade system. The Braun does feature innovative Sonic technology that catches the hair with efficiency but doesn’t have the double-blade capacity that cuts hair below the skin level. Braun does have multiple modes to adjust the power settings and boasts of its smart shaver ability to read and adapt to beards, which are similar to the features of the Philips Norelco. However, it doesn’t have the convenient display readings or the eight-directional facial contour capabilities. This award-winning razor has a 5-blade shaving system. It is powerful and efficient but doesn’t have the technology that the Philips Norelco has to lift the hair and cut it for a closer shave. The Panasonic does have a beard density sensor but doesn’t have a separate head for trimming beards like the Philips Norelco. Although the Panasonic has a multi-flex pivoting head to provide a smooth glide along the contours of the face and neck, the Philips Norelco is more flexible with its ContourDetect technology. The price of the Philips Norelco Shaver 9800 is higher than some brands but well worth the investment. With its ample features, it accommodates the busiest of lifestyles and the most demanding of occupational appearance requirements. For casual or professional use, this shaver can meet every challenge, with comfort and accuracy. The quality performance it delivers along with its durable components makes this shaver an ideal selection. Of course, you must decide for yourself what fits your needs and budget. Just keep in mind how many shavers you may have to purchase to meet the same quality. Consider the Philips Norelco Shaver 9800 for a reliable, refreshing, and comfortable shave. Remington Hyperflex Rotary Shaver Review – Is the New XR1470 Model Worth the Money?